For most people wherever they are in the world, this is a time of greater uncertainty than usual. For those of us based in the UK, so long as we stay at home, then perhaps the unexpected is largely explainable. But any traveler going abroad now faces a world in which a very good deal is not yet know. 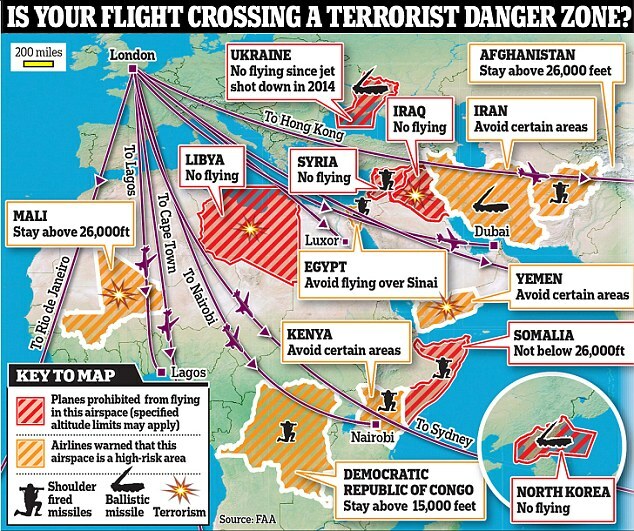 I copy alongside an infographic from the Daily Mail reminding pilots of the places they cannot fly over once leaving our shores; lots of red and big bold lines makes the image seem really quite threatening. It’s quite obvious that pilots and air traffic controllers need to be very alert, not just because there are thousands of planes up there in the airspace, but because there is so much more now to concern them. The growing threats caused by instability around the world is bringing severe challenges to learning communities, such as those found in schools, colleges and universities. Rolling out here at Claires Court amongst our staff and for use with our pupils is work wrapped around the ‘Prevent’ strategy, through which we hope we can raise our community’s consciousness and ability to respond to the ideological challenge of terrorism and the threat from those who promote it. I quote further from the government’s own Prevent publication: “In doing so, we must be clear: the ideology of extremism and terrorism is the problem; legitimate religious belief emphatically is not. But we will not work with extremist organisations that oppose our values of universal human rights, equality before the law, democracy and full participation in our society. If organisations do not accept these fundamental values, we will not work with them and we will not fund them”. The introduction to this document was written by the Home Secretary, Theresa May MP, our own representative for Maidenhead in the House of Commons. She has a challenging job, made less easy I dare say since she has to manage substantial ongoing change in the Police Force, to take costs out whilst maintaining or indeed enhancing the provision of law and order. I see Police Forces are beginning to deploy drones to assist with law enforcement along with other high performance technologies such as heat seeking and movement detection. Such rapid technology change will require new skills to be acquired, not just a reduction into lowly paid security guard work, and there’s the rub. Are our security forces of the calibre to be trained? Where once we had policemen patrolling our streets, we now have council uniforms with full fluorescent flashes to cover this mundane activity. So long as we are a law abiding society, that’ll work I guess. But I fear the plans to cut back even more sharply on our public services just now are ill-judged, and here’s why. Seeing now the settling of very substantial groups of Syrian and other nationality refugees in other European countries, training educational communities to look out for needles in a hay-stack (spotting radicalisation) seems very much off the mark. Austria, Germany and Sweden are preparing local towns for a mass influx of hundreds and thousands, displaced children and lone adults, as well as families or friends, This new population is going to be there into the medium/long term. As one headline this week (again from the Mail on-line) makes clear, “First of 750 migrants arrive in tiny German village with a population of just 102 (including a neo-Nazi councillor) bracing itself for 700 PER CENT population hike”. In the living memory of the oldest German citizens, these mass migrations they are seeing now are on a similar scale to those that arose at the end of World War 2. Some 2 million Germans for example left Czechoslovakia, and on most borders in the Baltic and the Balkans between 10,000 and 20,000 Germans were being unceremoniously ousted from their adopted homes. Some 500,000 alone had to leave Yugoslavia. At the same time of course, the departing Germans left homes, land, jobs etc. needing to be filled; the Russians now in occupation of Poland forcibly removed 2 million to the west, whilst moving almost as many Ukrainians and Belorussians eastwards to take up the work available in the USSR. Anyone able to move to the ‘free’ world west of Germany did, some 900,000, and the UK took its fair share. For example, the ex-pat polish population local to Maidenhead and Slough grew heavily as a result. I’ll not extend the History lesson further – feel free to read more on this BBC refugee article; suffice it to say my own father’s post war experiences as a tank commander in Germany included witnessing the mass repatriation movements both west and east. I take seriously my responsibilities to ensure that our school community learns and understands how to manage the risks we face from unprecedented terrorist threats, and to do our best to prevent radicalisation in the first place. However, because the political damage would be so great, currently I see no leadership from our government or parliament in how we are going to assist the northern hemisphere with the largest forced migration seen this century, bigger even dare I say than that of the Second World War. 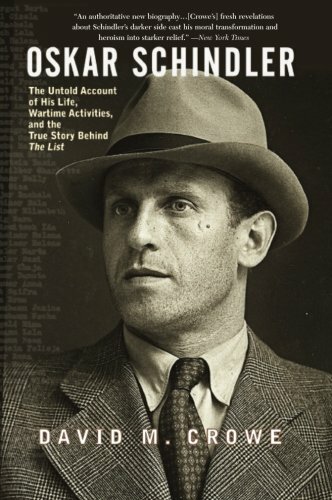 “As a Nazi Party member and war profiteer, Schindler must flee the advancing Red Army to avoid capture. The SS guards have been ordered to kill the Jews, but Schindler persuades them not to so they can “return to their families as men, not murderers.” He bids farewell to his workers and prepares to head west, hoping to surrender to the Americans. The workers give Schindler a signed statement attesting to his role saving Jewish lives, together with a ring engraved with a Talmudic quotation: “Whoever saves one life saves the world entire.” Schindler is touched but is also deeply ashamed, as he feels he should have done even more”. I am actually much more challenged by the impending Refugee crisis soon to be with us. No amount of technology, nor the smooth words of politicians will hide from our country the very real challenge it will be asked to face to engage with and support the relocation of its fair share of 3 million refugees. Unless I am very much mistaken, the statistics already show we are relocating some 600,000 a year into the UK, and if in public we don’t accept the refugees, we’ll be having to home those in Europe displaced by that refugee flood nevertheless. It happened before in my parents’ life time, and it’s coming back now. I wonder who will deserve the plaudits this time?